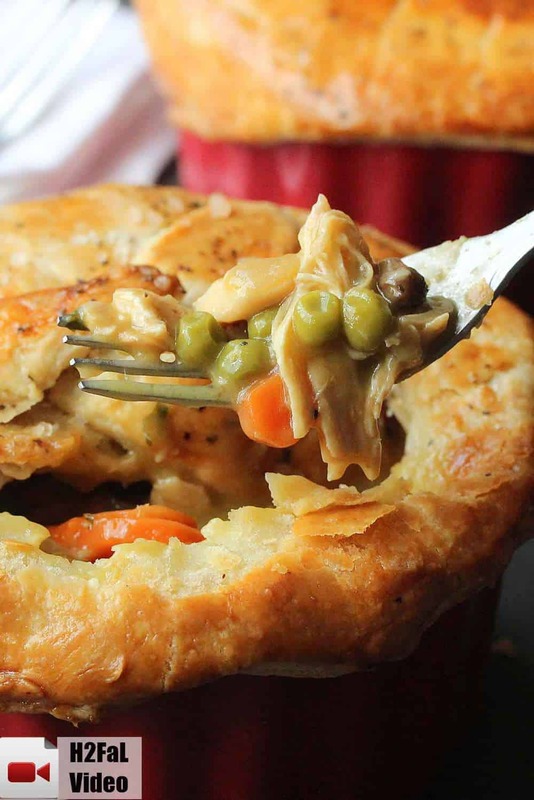 Amazing Chicken Pot Pie: Brace yourself, this recipe is almost too good to mention. This is comfort food at its all-time best. If you can, go with homemade chicken stock, it really makes all the difference. And roasting the chicken delivers the most flavorful and succulent chicken possible. 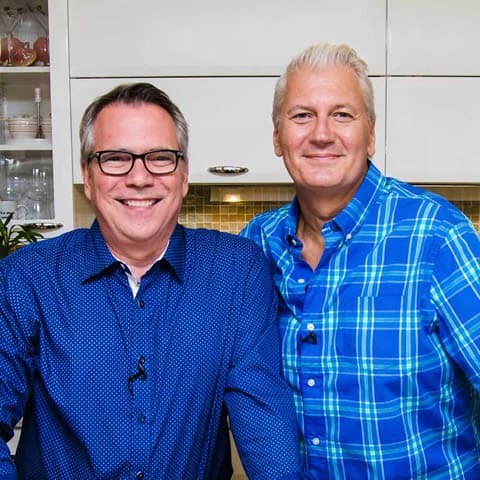 Watch us show you how to make this Amazing Chicken Pot Pie! Add that with the other classic chicken pot pie ingredients, and you’ve got something really special on your hands! And, of course, homemade pie crust…is the perfect top for this perfectly amazing and super comforting dish. 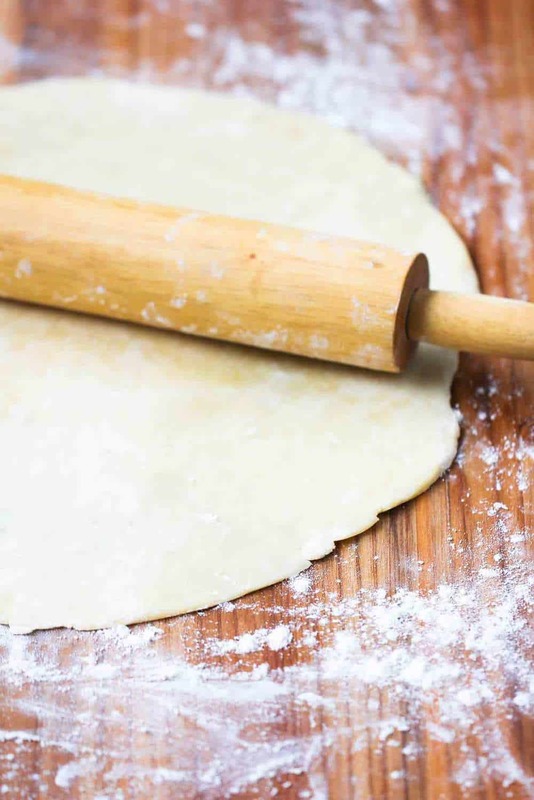 Take the time, and be sure to make the Perfect Pie Crust. You will be so glad you did! After the filling thickens and cooks to perfection, it will be difficult for you to not want to eat just a bowl full of the filling! The Loon says it’s like amazing “Pot Pie Soup.” He’s right…but it’s not finished yet! An egg wash on the top of the dough ensures a golden beautiful crust when it comes out of the oven! 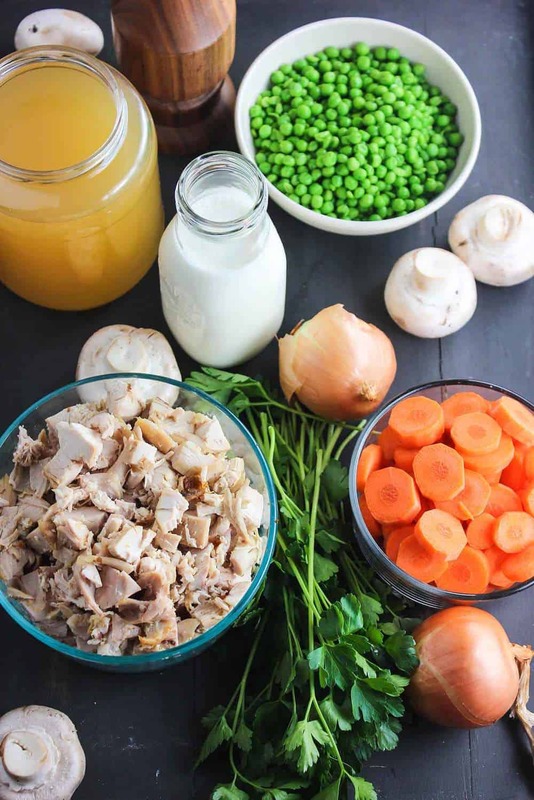 Everything comes together to make hands-down the best tasting chicken pot pie recipe you’ll ever know. 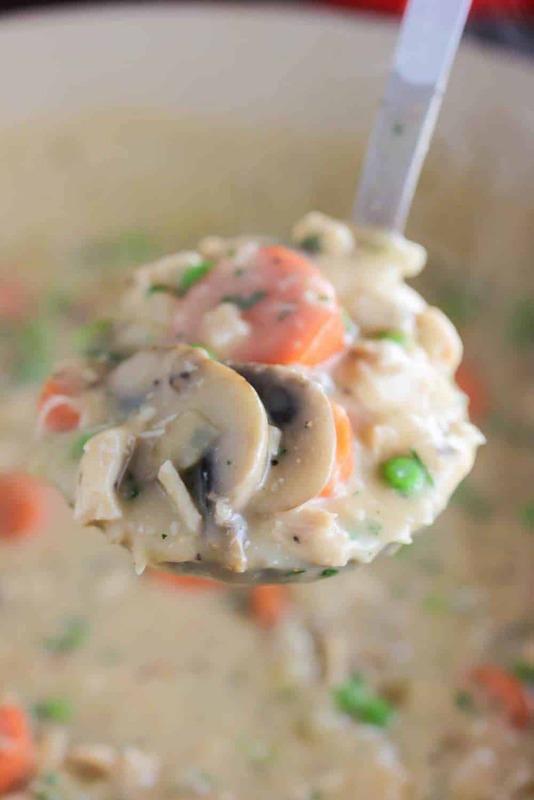 This is chicken pot pie recipe is absolutely the best! This is without doubt, an all-time favorite of both The Loon and me. Amazing Chicken Pot Pie!! %150 Loon Approved! 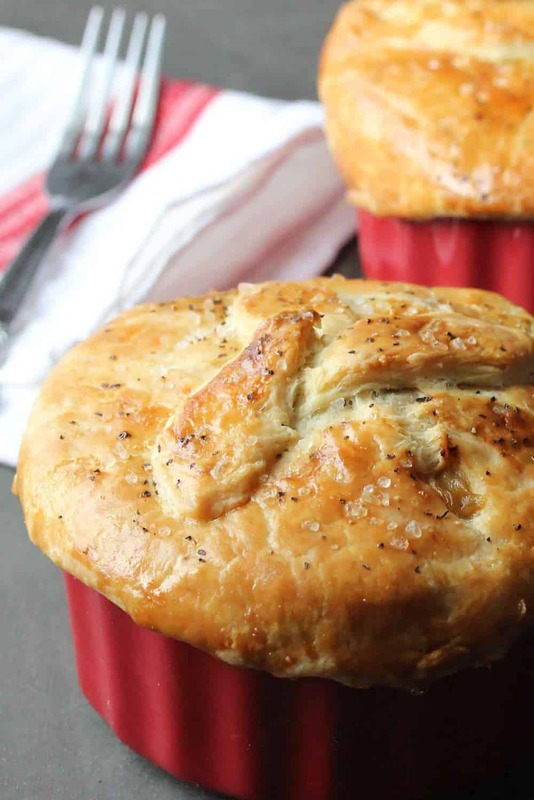 Now, let’s make this Amazing Chicken Pot Pie recipe! 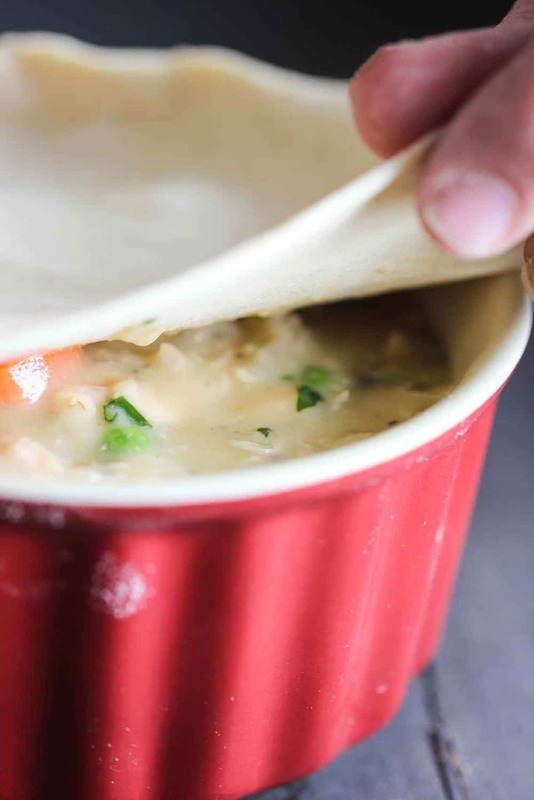 Get ready...this Amazing Chicken Pot Pie recipe really is...amazing. If you can, use homemade stock and homemade pie crust. You simply will not believe how good this is. This is hands-down one of our all-time favorites. Make it! You'll love it! Place chicken breasts on a baking sheet and rub with oil. Sprinkle generously with salt and pepper. Roast for 65 minutes (internal temp should be 165 F) - set aside until cool enough to handle. Remove meat from bones and discard the skin - cut the chicken into large bites. Heat the stock in a medium pan. Dissolve the bouillon cubes in the stock. In a large skillet, melt the butter over medium-high heat and add the onions and mushrooms, cook until translucent - about 15 minutes. Add the flour and cook over low heat, for about 2 minutes. Add the hot stock to the sauce, simmer for another minute or somewhat until thickened. Add 1 teaspoon of Kosher salt, 1/2 teaspoon of black pepper, and heavy cream. Add the cubed chicken, carrots, peas, and parsley. Mix well. Pour filling into 4 oven-proof bowls. Brush egg wash around the top edges of the bowls. Place cut dough on top of each bowl. Press the sides against the edges of the bowl. Brush the dough with egg wash, and then sprinkle with coarse salt (sea salt, or Kosher) and freshly ground black pepper. Make 3 or 4 slits in center of each dough topping. Place on baking sheets and bake for 45 minutes. I made it for the third time tonight and felt I finally needed to leave a review so others can trust this is perfection. My husband loves pot pie and he devours this one every time. He said it’s the best he’s ever had and now the bar has been set. My four year old son also gave it two thumbs up! Lol. I used a leftover chicken that I cooked whole in my Instant Pot. If you’ve never done this, I highly recommend it for flavorful tender chicken that can be eaten as is or in other recipes such as this one. I also used a bag of frozen peas and carrots just for ease of it. To make the 5 cups of broth, I used one box of chicken bone broth (4 cups) and added a cup of water with an additional chicken boullion. Thanks for this phenomenal recipe that I’ll be using for years to come! This was soooooo deeeelish!!! I cheated and used a rotisserie chicken and I used puff pastry that I had in the freezer. Other than that I followed the recipe as written and it was sooo good! I tasted the filling before putting it in the pie plate, then I had to taste it again, and again….. You get the idea- i had to back away slowly from the filling! Thanks for sharing this, it’s amazing! I don’t usually review or comment on anything, but I just had to review this recipe! It was absolutely FABULOUS!!! Thank you so much! I made a couple of changes. I substituted 3 cups mixed frozen vegetables for the peas and carrots (mostly out of laziness) and added dashes of cumin and curry powder, just because my husband really likes curry. It was amazing! My husband had to stop himself from going back for fourths and my children gave it two thumbs up! I made it in a deep round casserole with a double crust, and there was easily enough filling to make another, so I froze it for later. They asked me this morning when we can have it again and my husband said it was truly something special. It will be going on the regular rotation. Thank you!!! My partner and I have my grandchildren for the summer and my oldest wanted me to make chicken pot pie. Well, I searched and searched for my grandmothers recipe to no avail. Searched on Pinterest and this reciepe popped up. Followed it to a T. Pie crust and all. My grandsons ate the entire pie less a small serving for me and my partner. Thanks guys, this will be the new hand me down secret recipe. Could the filling and crust be frozen? Hi Becca! Absolutely! I do that all the time! They can be frozen separately, or you can assemble the pot pie and then freeze. Just thaw before baking, or add another 25 minutes to baking. Hope this helps! Amazing is right! This is the BEST Chicken Pot Pie I have ever eaten. Followed the recipe to the letter, including the crust. My husband loved it as well. I will use this crust recipe for pies too. It is flaky and easy to work with. Thank you, Kathy! That’s is so wonderful to hear! 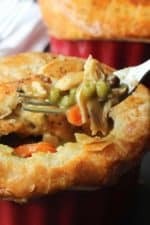 We LOVE this pot pie and we are thrilled to hear that you made the crust…we agree, it takes this pot pie over the top. Please stay in touch and thanks for reaching out to us. All the best, Kris & Wesley. Hey Kris and Wesley, just wanted to stop in real fast with a review on your AMAZING CHICKEN POT PIE… I, and about 20 others, give this homemade recipe 10 stars!!!!! I made it, as Kris had suggested, in a 13×9 baking dish for our first Pot-Luck dinner of the Fall season and it was THE DISH OF THE NIGHT! Thank You so much for the crowd pleasing recipe and for your very helpful “How To” video. Can not wait to try many of your other recipes. Delicious! I’m ready to start, but when do you use the olive oil? Chicken pot pie is such a wonderful dish. I wish I like cooked carrots, but I’ll have to leave them out of this recipe. Gets me motivated to start making my own pie crust! Hello, this sounds wonderful! Have you ever tried this with one big pie and a bottom crust as well? 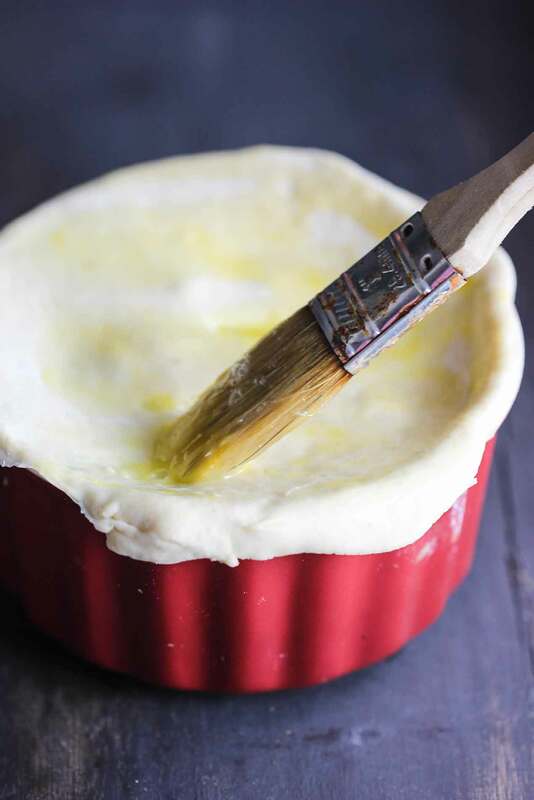 How is it that this morning I pick your waffle recipe off Pinterest and then this afternoon, the first pot pie recipe I click is yours as well? Looking forward to trying it, chicken boiling now. Thanks for your awesomeness! That is amazing!!!! How did the chicken pot pie turn out? 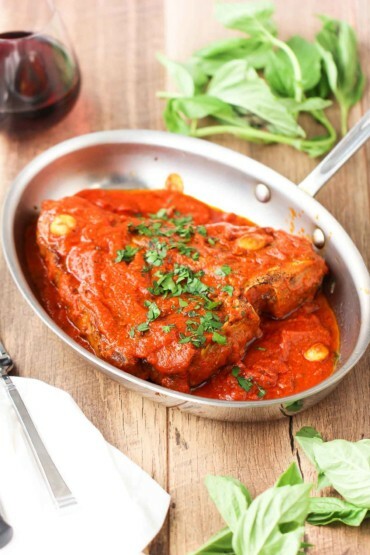 That is hands down one of our favorite comfort food dishes. Thank YOU for you aweseomeness!!! When do you add frozen peas? Hi Lori! Thank you so much. Oops! Left the peas out of the instructions. Add them when add the cooked chicken, carrots and parsley. I’ve updated the recipe to reflect this. Thanks again! Let us know how it turns out! This is one of our all-time favorites!